From hitting the slopes of Queenstown, to cosying up in pubs and wineries by the fireplace with a glass of red wine - winter in New Zealand’s not so bad when you think about it. Forget about hibernating through the cooler months, there’s so much to explore this winter. Here are a few experiences to get you inspired to get out and make the most of the winter wonderland at your doorstep. Tired of skiing the same runs every winter? Take things up a notch and take things to the next level with a heliski experience. This experience is perfect for adrenaline junkies looking for their next adventure. Gift a Heliski day with lunch and transfers. Like the idea of hitting the slopes, but can’t quite master skiing? How about taking a scenic 20-minute helicopter flight over Fox Glacier or Franz Josef Glacier and landing in a stunning snowfield? The views on this tour are simply incredible. Gift a west coast glacier helicopter flight with an alpine landing. Can’t get enough of the cold? Pop on your winter woollies and step inside Queenstown’s ice bar where you’ll enjoy a couple of cocktails in -5-degree temps! Gift and Ice Bar experience. Arrowtown and Wanaka are beautiful all year round, but the snow-capped mountains as a backdrop really do make it extra special. The photo opportunities on this tour are amazing – your Instagram feed will thank you! Gift an Arrowtown and Wanaka historic tour. Swap the skis for a combination of a skateboard, jetski, tank and motocross bike. 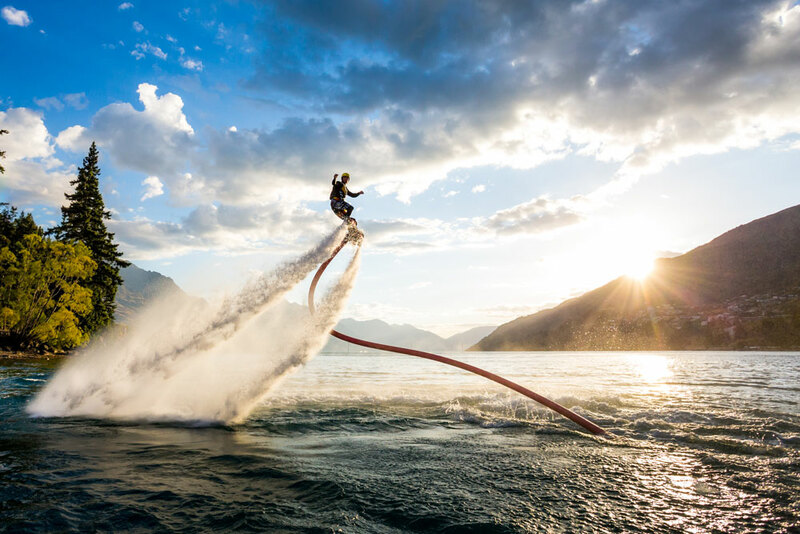 The mountain shredder is the new craze for thrill-seekers and a great way to take in the sights of the stunning Queenstown and Arrowtown scenery. Gift an off-road mountain shredder tour. Spent all day heli-skiing or mountain shredding? We’ve got the perfect way to relax and unwind. Take in the stunning views of Queenstown from your private hot tub while sipping on a cheeky glass of wine. Life doesn’t get much better than this! Gift an evening hot pools private bathe with indulgence pack.